Did You Buy The Right Smoke Alarm? According to the NFPA (National Fire Protection Association), 96% of homes in the United States have 1 or more fire alarms. What a great statistic. They save lives after all – or do they? Fire alarms are designed to protect you from fires. But not all types of fire alerts are equal, and some don’t detect all the signs that a fire is on the loose until it’s too late. What kind of alarm do you use? Do you Know? Have you heard of photoelectric alarms? 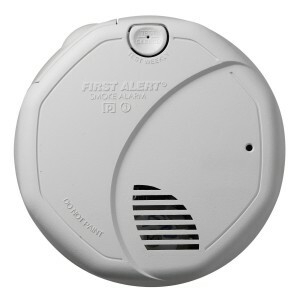 THEY ARE THE ONLY TYPE OF SMOKE ALARM TO BUY. Ionization Alarms – these are best detecting cooking fires and fast combustive type fires that usually occur with human intervention during active hours. These alarms alert you so you can make your escape. Photoelectric Alarms – these alarms are more tuned to detect smoldering fires, heavy furniture fires, fires started by cigarettes, materials that slowly heat up like man made woods (think MDF and synthetic kitchen units). Scarily these fires usually happen in the late evening and can erupt later on during sleep hours. Ionization & Photoelectric Alarms – a combination of the 2 systems. ALARMING statistic – ionization only models make up 90% of the home market. Education is needed. In this video the NFPA explains why you need an alarm that uses both photoelectric & ionization systems. 12% of all fires start due to smoldering flames. Shockingly these types of fires account to 50% of all fire fatalities and a third of all fire related injuries. This proves that ionization alarms RARELY save lives. They usually set off the alarm when it’s too late. Ionization alarms react generally half an hour slower than photoelectric alarms. Ionization alarms have the letter “I” imprinted on them if the labeling is still visible. They can also have “Americum-241” or they can display they contain radioactive materials. Photoelectric alarms can have a “P” printed on them or the full term, photoelectric. If in doubt buy a new alarm system. In many respects your safety is your responsibility. It doesn’t help that the government is not creating laws that all alarms should contain photoelectric and ionization dual detection systems. Even the firefighters code has no recommendation of this. The statistics prove the obvious. Now you are aware of it, don’t ignore this advice. The governments own research which you can see here (skip to the end of the third paragraph), states that photoelectric alarms react SUBSTANTIALLY earlier then ionization only alarms in smouldering fire types. Remember 50% of all fire related deaths are caused by these fires which are also the most common type of domestic fire. All that remains is for state fire marshals to START recommending the use of dual system fire alarms and make them mandatory in all public buildings and all new building projects. In most outbursts of flaming fire scenarios it takes as little as 3 minutes for the outburst to make most fire escapes almost impossible. Early warning is key. The ionization element inside a dual sensor smoke detector will kick in after it detects the outbreak of flame burning fires. The photoelectric system will kick in the moment it detects the presence of a smoldering fire outbreak. This is usually 20 minutes before an ionization only alarm. You need both technologies in your alarm. The photoelectric system is not as fast as the ionization alarm at noticing a fire flame break out. That’s why you need your alarm to have both. They save lives. Australia are taking the lead on this issue. In Queensland the Commissioner of the fire and rescue service (QFRS). They are pushing for all residential properties to be fitted with photoelectric alarms after research by the Australasian Fire & Emergency Services Council (AFAC) found that photoelectric alarms give earlier warning alerts and are best at detecting a broad range of fires. Interestingly they also contain no radioactive materials. Is Your Smoke Alarm Disabled? We’ve all done it before. Due to an over sensitive alarm we’ve set the smoke alarm off. After countless times usually from cooking in the kitchen, we’ve taken out the batteries. Ionization alarms are usually more sensitive to becoming nuisance alarms as they go off quite easily if your burn even some bread in the toaster. If you’ve taken out the batteries or even removed the power or taken your smoke alarm off the ceiling don’t forget to put it back. Don’t forget to replace the batteries. You also need to change the batteries once a year, and test them to see if they are working regularly. Smoke alarms need to be changed every 10 years. They monitor the air 24/7 and go through millions of monitoring cycles after a decade. After prolonged use they become unreliable and need to be replaced. Insects, dust and contaminants also corrode it’s elements and circuitry. An old smoke alarm might be nothing more than a dead ornament. Don’t take any chances. Spending $30 once every 10 years, you do the maths.